The White House announcement Tuesday that Nikki Haley would be leaving her post as U.S. ambassador to the United Nations appears to have caught most people – including the White House staff – by surprise. But it has not taken long for the assessments of her tenure to be filed. The combined assessment of her tenure is mixed. Haley deserves full marks for getting tougher sanctions on North Korea and South Sudan through the U.N. Security Council, despite Chinese and Russian reluctance. Diplomats appreciated working with her even if they disagreed with her. “Haley managed to represent the United States at a multilateral institution for an administration that is highly critical of multilateralism,” Emily Tamkin notes in BuzzFeed. This is not to say that her tenure was an unalloyed success. Haley did not always take slights terribly well. She responded to a massive U.N. General Assembly vote against the U.S. move of its Israeli Embassy to Jerusalem by throwing a “petty party.” When Haley defended the U.S. decision to withdraw from the U.N. Human Rights Council, she claimed in a speech that U.S. human rights groups had “sided with China and Russia,” which is a repellent thing to say. And, like many current and former Trump officials, she still faces an ethics investigation. To be honest, however, that is pretty much the only thing Haley had in common with the rest of President Donald Trump’s foreign policy team. In contrast to the rest of the cast of characters, Haley retained considerable respect in conservative circles. CNN commentator S.E. 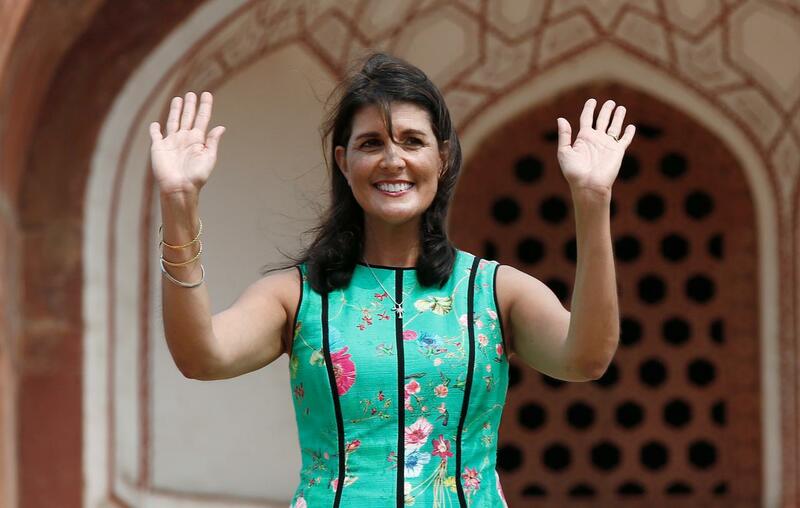 Cupp noted, “Among conservatives, who have long been critical of the United Nations’ historical inefficacy, many of us believe Haley used her position well to stand up not just for America’s interests but also democracy’s. She was often a lone voice of support for Israel among a body that is hostile toward it as well as a powerful foil to Russia, Syria and Iran.” Haley also earned respect across the board for her refusal to shy away from criticism of Russia. How was Haley able to pull this off? She had two traits that made her unusual within the Trump foreign policy team. The first is that she was a professional politician. This meant she was able to send messages to key constituencies, pleasing the Trump White House at times and other groups at other junctures. At the White House on Tuesday she claimed: “Now the United States is respected. Countries might not like what we do, but they respect what we do.” That is flatly wrong – see results this month from two polls, one by the Pew Research Center on global attitudes toward the United States and one by the Chicago Council on Global Affairs about U.S. attitudes toward foreign policy. But Haley’s ability to say things like this with a straight face endeared her to this White House. This did not go unnoticed. One former senior administration official told Vanity Fair’s Abigail Tracy, “I think her time at the U.N. has demonstrated very clearly that she will do whatever is politically expedient for her future political aspirations. … Every stance that she has taken is carefully calibrated to burnish her credentials for her presidential run.” If so, it worked: she polls pretty well, even among Democrats. Haley’s true gift, however, was to pick the right fight at the right time within this administration. When National Economic Council Director Larry Kudlow claimed Haley must have been momentarily confused after an announcement on Russia sanctions had not come to pass, Haley responded, “With all due respect, I don’t get confused.” That statement produced something extraordinary: an apology from a Trump White House official. In the end, that is the primary takeaway from Haley’s departure. She was adequate at the United Nations post at a time when so few Trump national security officials demonstrated adequacy. Furthermore, her departure — in contrast to those of former Secretary of State Rex Tillerson, White House economic adviser Gary Cohn and National Security Adviser H.R. McMaster — was on her terms. Nikki Haley served in the Trump administration and departed with most of her dignity intact. That, in and of itself, is what makes her extraordinary.